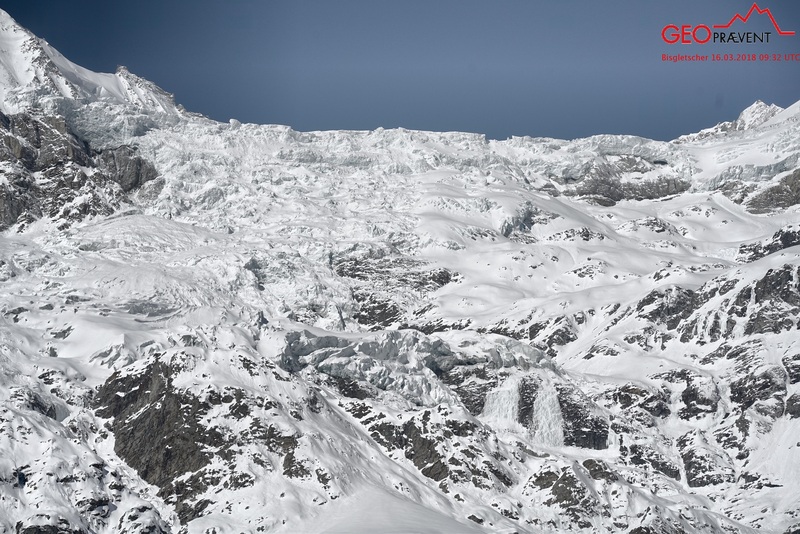 The Bisgletscher is located on the eastern side of the Weisshorn and Bishorn in the Valais Alps, Switzerland. 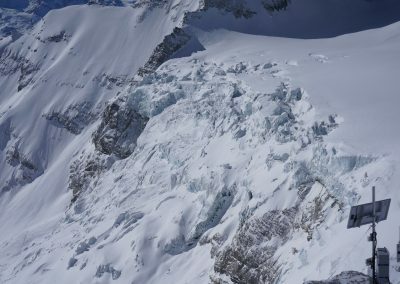 The ice masses originate from the steep rock faces of the Weisshorn and merge with those coming from the Bishorn in a basin further down. The glacier then descends over a steep edge to the east into the Matter Valley. Ice masses of various size frequently release in the lower part of the glacier due to the steep gradient of more than 60% (in some areas). 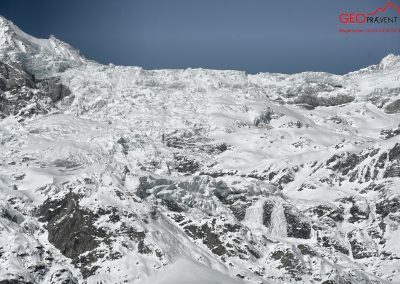 These ice avalanches, combined with considerable amounts of fresh snow, can reach large dimensions and threaten the village of Randa, the cantonal road (access road to Zermatt) and the Matterhorn Gotthard Railway. The avalanche cone can further dam up Vispa river and create a lake with the potential of flooding. Major events have repeatedly claimed human lives, especially in earlier times, whereas in the last century they have caused major damage to property (VAW – Laboratory of Hydraulics, Hydrology and Glaciology (ETH)). 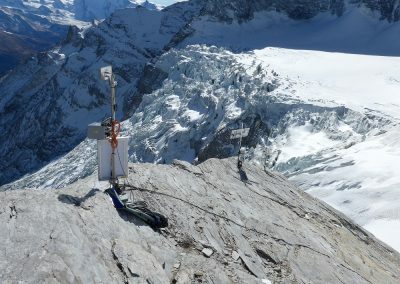 Monitoring of the Bis glacier is divided into two subsystems: a warning system for long-term observation of the steep glacier slope and an alarm system for ice avalanches resulting from glacier collapses. 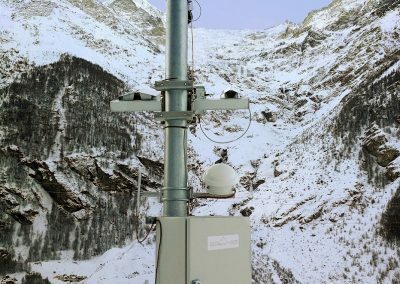 Three high-resolution deformation cameras monitor the long-term glacier movement while our avalanche radar detects ice avalanches in real-time. 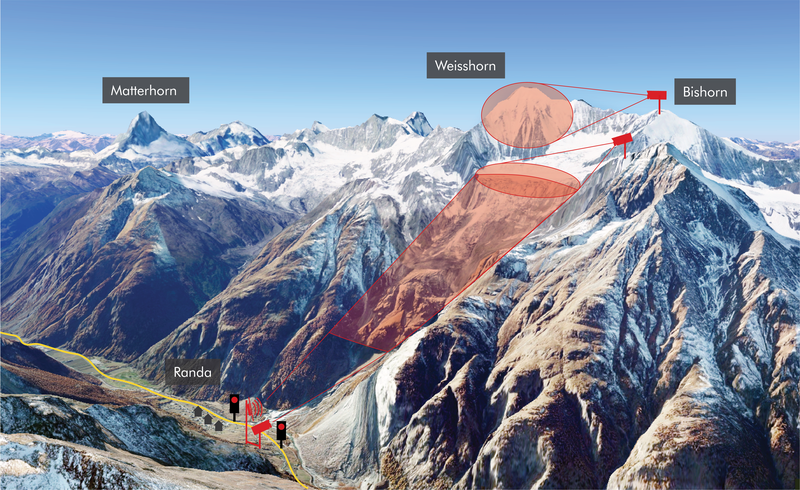 A combined station with deformation camera and avalanche radar is located in the valley at the village entrance of Randa, a second smaller station is located further up at the escarpment of Bis glacier. 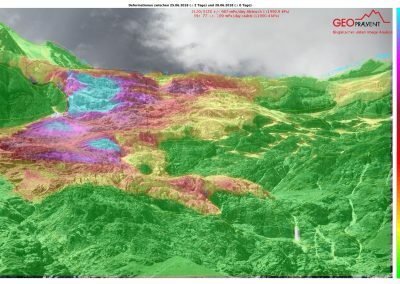 A high-resolution camera of 42-megapixel (valley) and a 24-megapixel camera (escarpment) take pictures of the glacier several times a day and send them to the Geopraevent servers. A sophisticated algorithm then automatically selects the most suitable images for deformation analysis. Subsequently, an elaborate image processing technique compares very small image fields with each other and identifies their displacements including direction. For selected areas, the velocity can further be displayed as a time series. The color scale corresponds to the change in pixels/day, with the pixel size depending on the distance. The measurements primarily serve to detect qualitative changes related to a starting point. 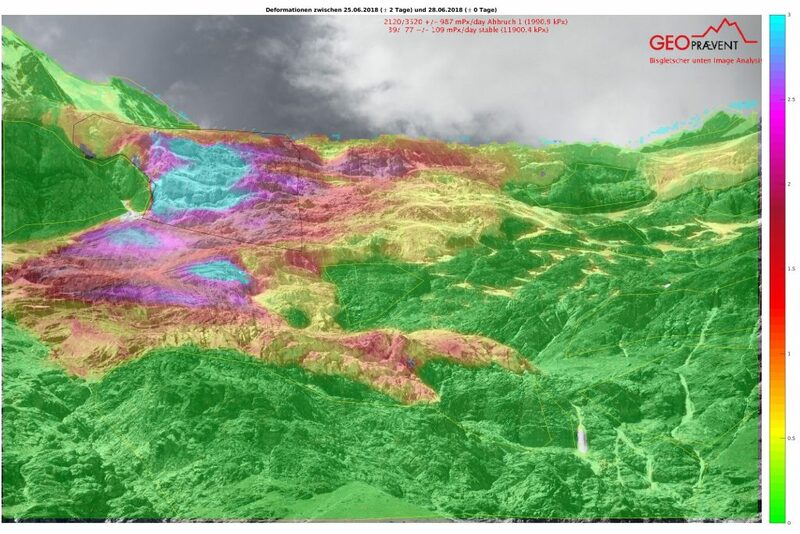 All data and images can be viewed by authorized users via the Geopraevent online data portal at any time. Deformation analysis of 28 June 2018 from the camera location at the valley bottom. 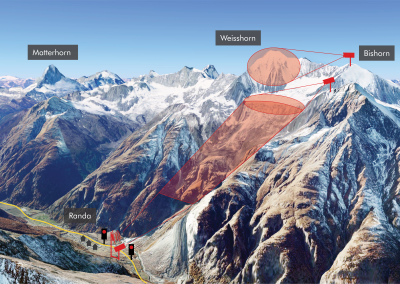 Our avalanche radar monitors the entire steep glacier slope for ice avalanches around the clock and detects falling ice masses even at a distance of 5 km. 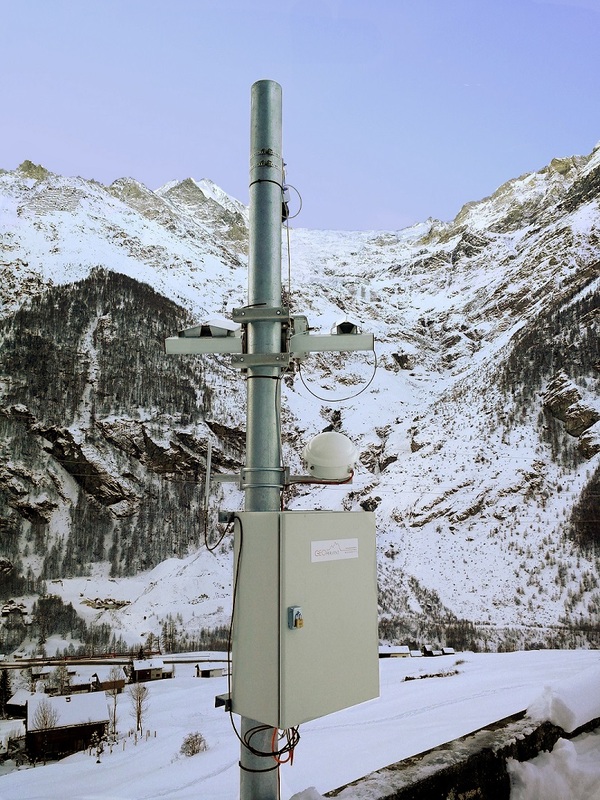 The avalanche radar is characterized by its high level of reliability: it detects moving snow and ice masses through fog and snow as well as at night. 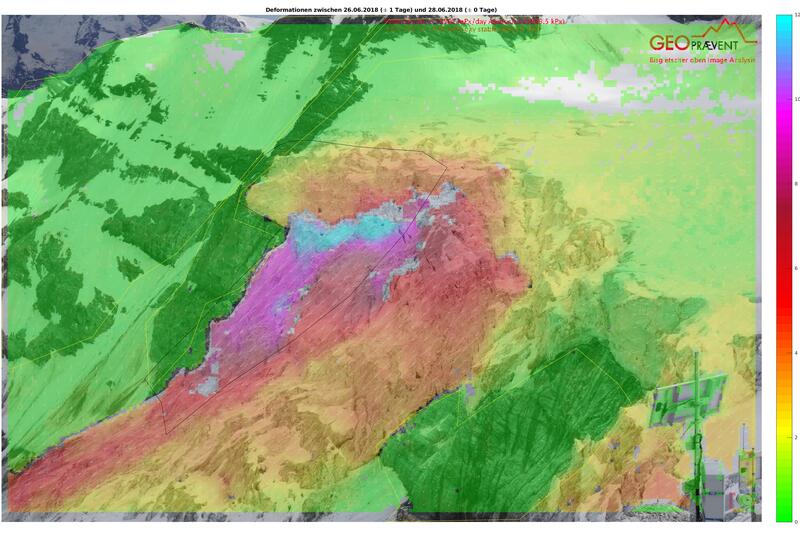 Once captured, the radar tracks the ice avalanche and an integrated camera records the event. In addition, it is possible to automatically close the road if the radar detects a large avalanche (alerting). Event video of 28 January 2018, 11 PM: The large avalanche can even be seen at night thanks to the moonlight. 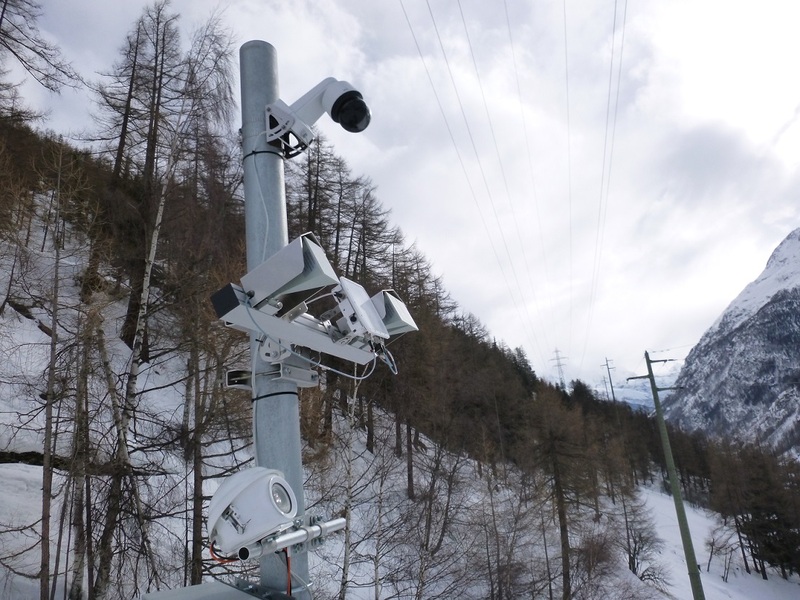 The avalanche radar ran during winter 2017/18 as a test and will be connected to the signalling system for automatic closure prior to the winter season 2018/19. With the test sensitivity settings, the radar detected more than 700 events during one year. 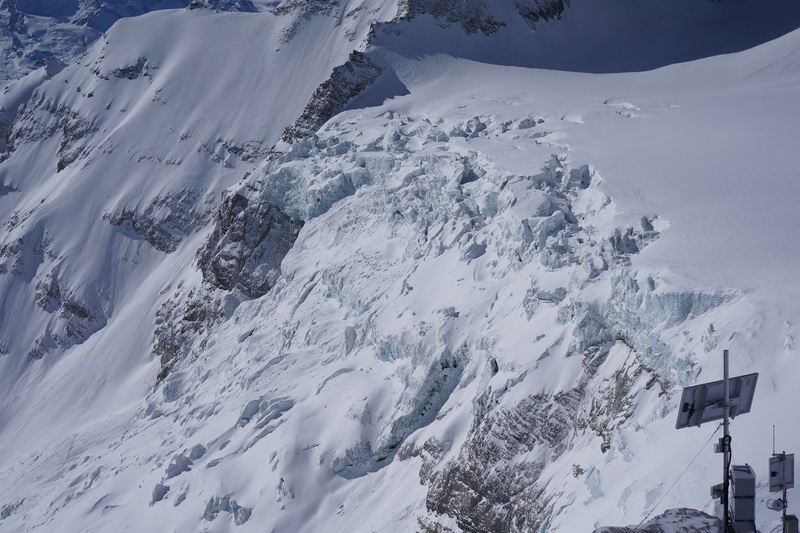 Among them were hardly visible small ice failures up to large avalanches (see video above). 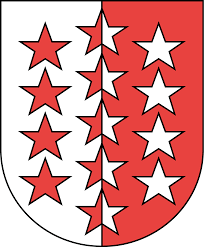 At least one avalanche in winter 2017/18 reached the cantonal road (20 January 2018, 9 PM), but did not cause any damage. View into the Matter valley with Randa, Bis glacier and the monitoring system (source GoogleEarth). 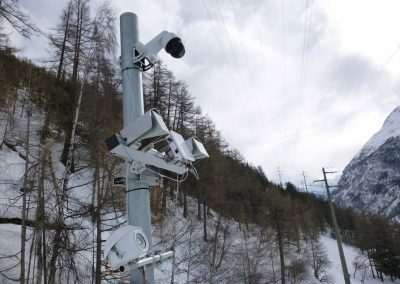 Station in Randa with deformation camera (bottom), avalanche radar with special antennas (middle) and a PTZ camera for event recording (top). High-resolution camera image of 16 March 2018 from the lower location. Deformation analysis of the Bis glacier from the valley camera station at a distance of up to 5 km. Another camera is installed at the valley bottom and observes the steep part of the Bis glacier. Several generations of cameras of the escarpment: Our station for the upper deformation analysis is in the foreground. High-resolution image of the camera from 16 March 2018 from the escarpment. 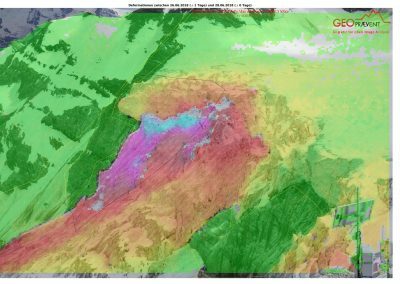 28 June 2018: Upper deformation analysis from the escarpment.